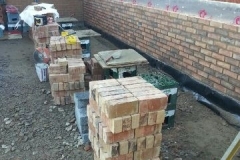 Heritage Builders provide many building services, and clients often come to us requiring bricklayers in Leicester to construct a wall for their garden, or undertake a similar project. When this happens, we’re happy to oblige, as our experienced team of professionals have been carrying out various building work in the Leicester area for over 35 years. Our famously clean workmanship results in robust and stable walls that also look great aesthetically, and we can construct an entirely new wall for you as easily as we can repair an existing one. Home or garden, we can definitely assist you. The Heritage team specialise in blockwork, stonework and bricklaying in Leicester, and our walls are built to last. Our qualified tradesmen are right up to date with all relevant building regulations and legislation, and are willing to work alongside the local authorities in Leicester to ensure the compliance of any building project too. This means that you can be confident of a durable and efficiently built wall that also ticks all boxes with regards to regulations, so you’ll never receive anything other than a great experience when you depend on us. View some of our former projects to see for yourself. 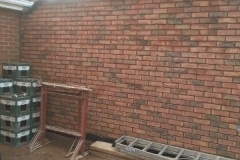 Whenever you need a skilled team of bricklayers in Leicester to construct a wall for your property, be sure to get in touch. Don’t forget that we can also built and repair patios, garages, and house extensions, so any of the areas that adjoin a wall fall within our capabilities too. We’ll make sure that any of the work that we carry out fits in well with your existing property, so you can come to us for a comprehensive building service, rather than a specific one, if you like. To find out more, contact our team now using our online form, or give us a call on 01509 814 123 today.